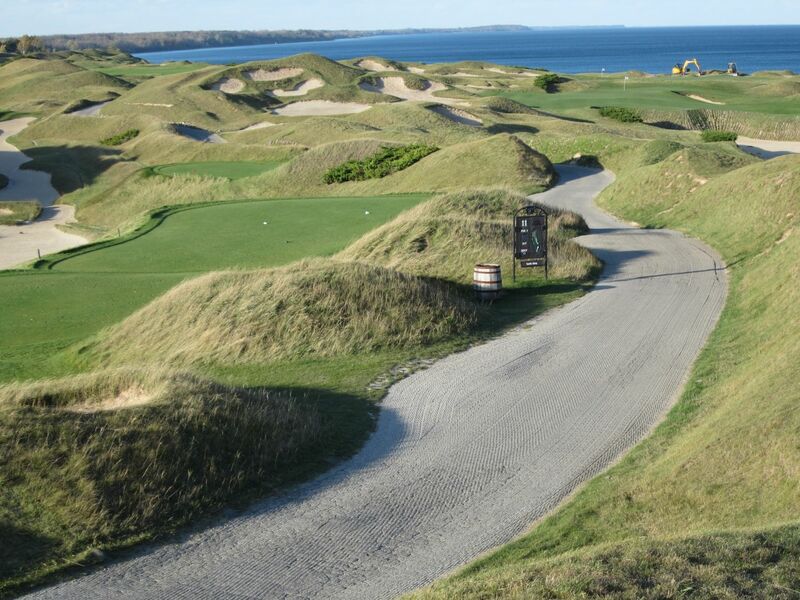 The Straits course at Whistling Straits, site of the 2004 and 2010 PGA Championships and future site of the 2015 PGA Championship and 2020 Ryder Cup, is slated as the number three course in the United States (according to GolfWeek and Golf Digest), and is the perennial number one track in the state of Wisconsin. At $340 for an 18-hole round [plus caddy fees], I cannot afford to play this mecca of the golf world. 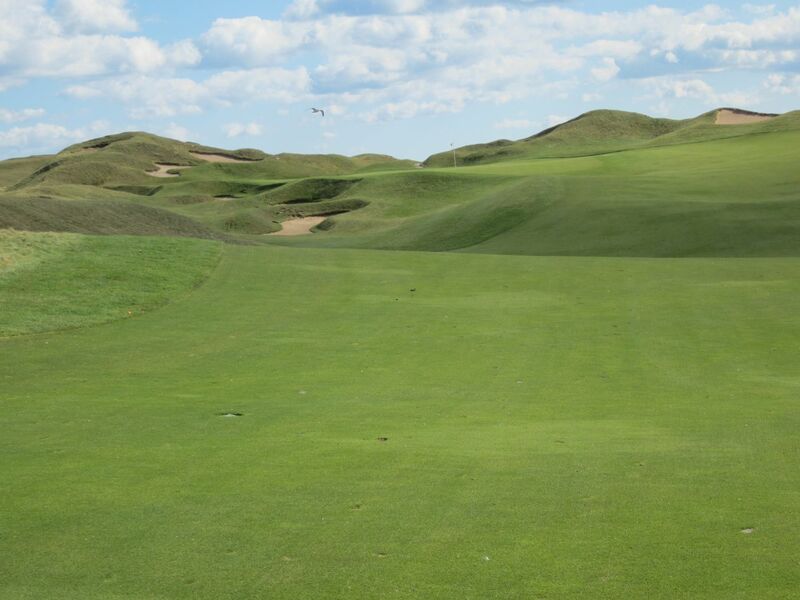 Whistling Straits also features another gem: The Irish. Having challenged the Irish several times, I wonder how highly it would be rated if it were not for the Straits. Like any big brother/little brother relationship, the Straits is unquestionably more impressive – nobody can argue that. That being said, the Irish is the best golf course I have ever played, and also receives plenty of acclaim in its own right. 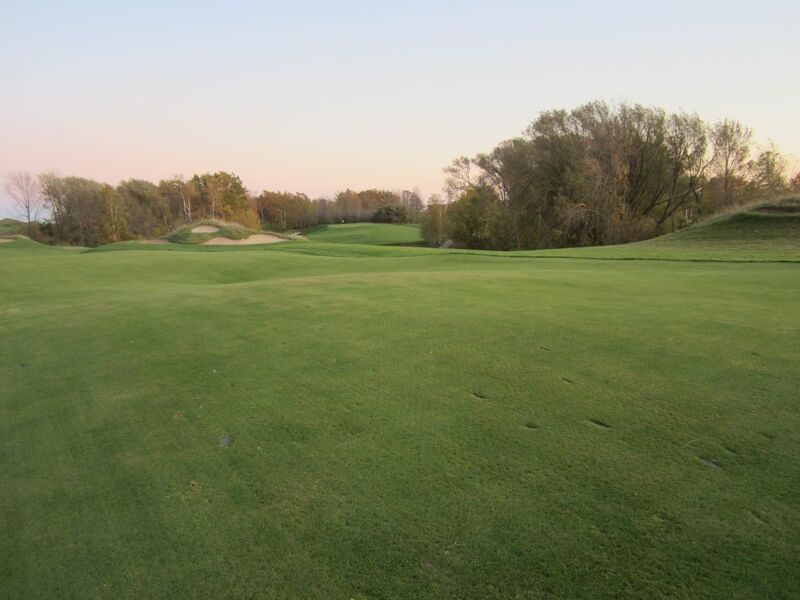 The Irish is 2011’s number 35-ranked course in the country (Golf Digest), and is in everybody’s top five in the state. Taking a look at the photographs below, you will see some of the reasons why. The Irish is unparalleled in Wisconsin, with the exception of the Straits. 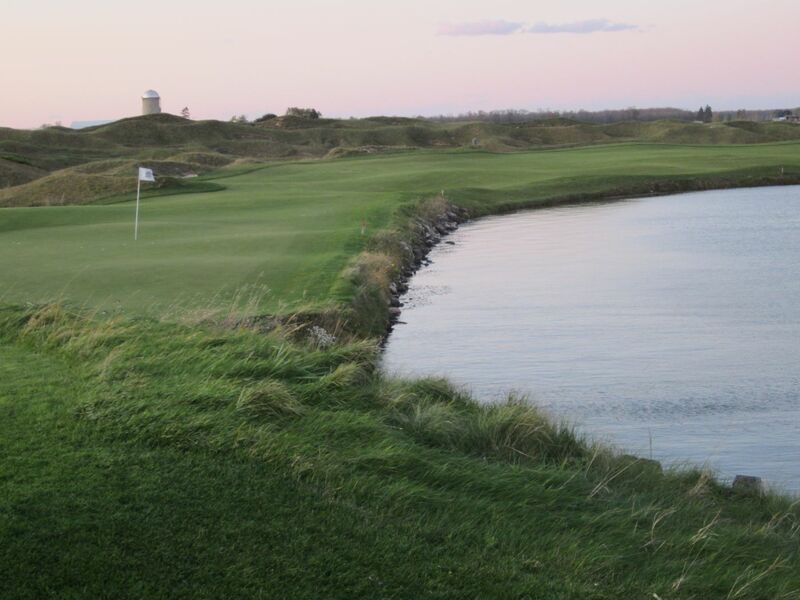 Whistling Straits is impressive from the moment you enter the property. 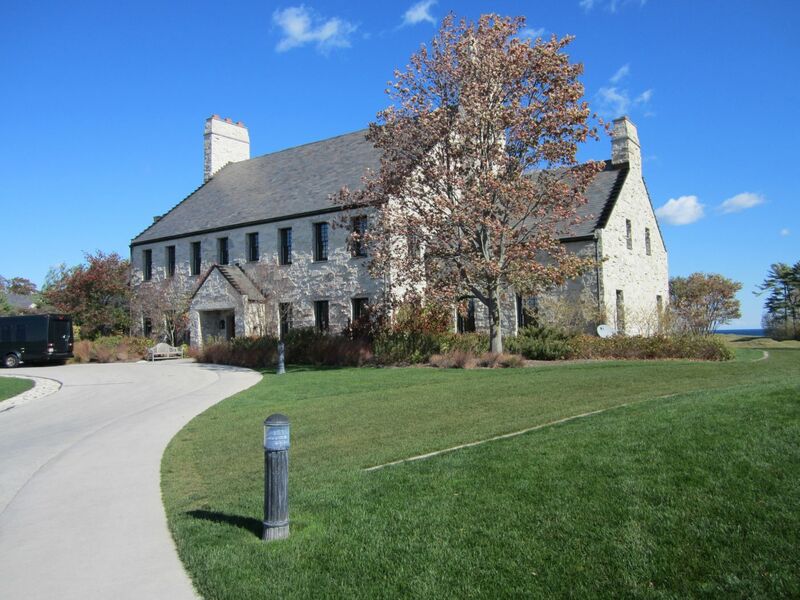 The beautiful white stone clubhouse overlooks much of the Straits, including the tenth tee at which I will never forget watching Vijay Singh hit the most majestic tee shot I have ever seen during the 2004 PGA Championship event. The practice area is immaculate. 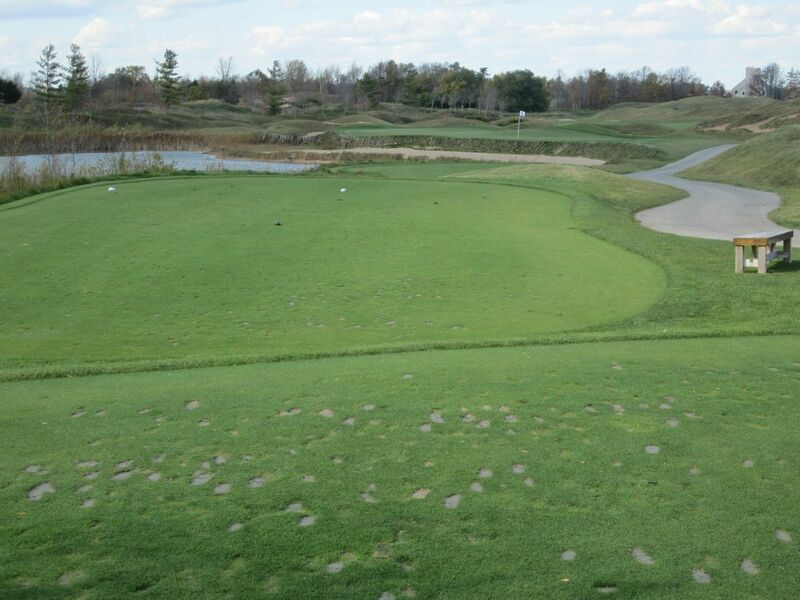 You will find no divots on the practice tees, nor on the course itself. From what the clubhouse manager told us, Pete Dye would not accept that. Interestingly, he also told us that Mr. Dye was not happy with the play of the 2010 Championship, and is re-structuring several of the holes on the Straits’ back nine to arbor a 2015 winning score between one and four under par. If they have anything like the wind we experienced on Sunday, anything under par seems like a major stretch. 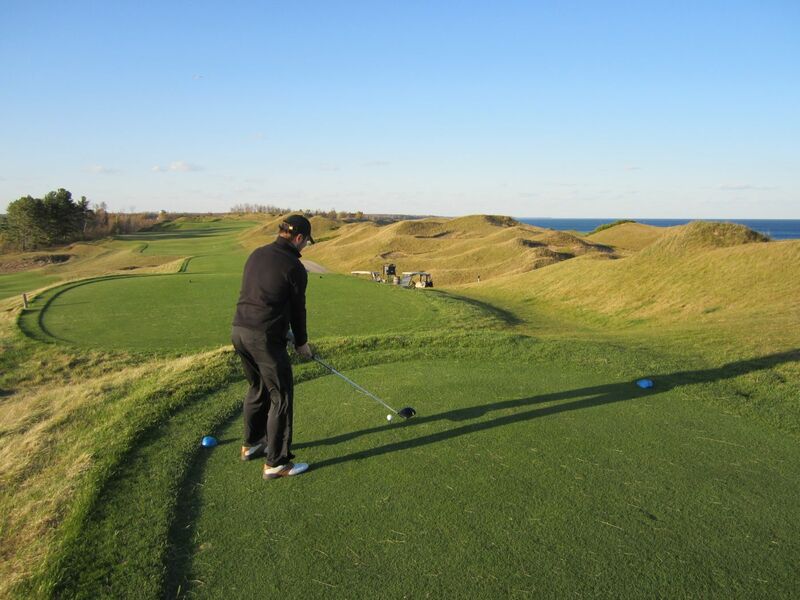 Bordering Lake Michigan, the courses are wide open and rarely unaffected by the elements. We had steady winds over 25 miles per hour, and gusts higher than 40-50. The back nine holes with views of the lake were so highly influenced that we were hitting shots angled at 45 degrees from targeted areas. See the video of hole number 11 for a terrific example of this. While it is interesting and in some ways fun, it makes scoring next to impossible. 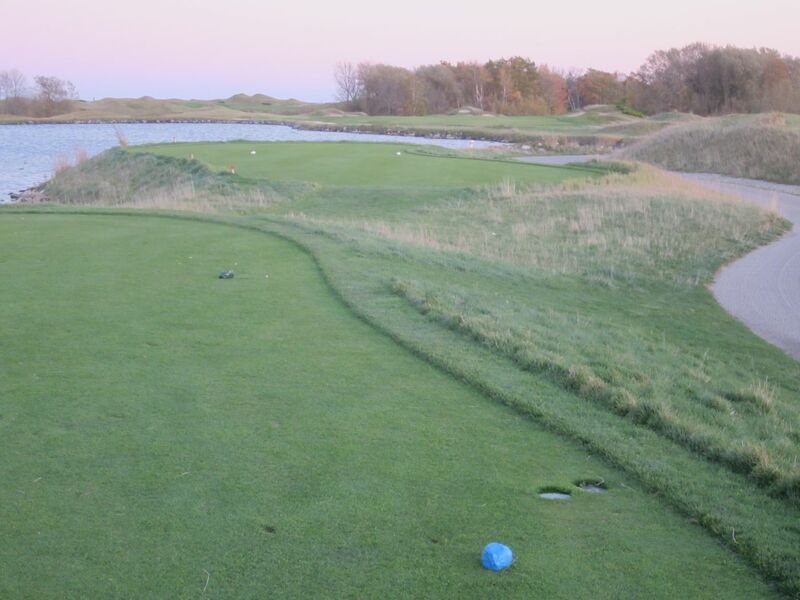 The first hole of the Irish course provides your first breathtaking view of Lake Michigan on the horizon. 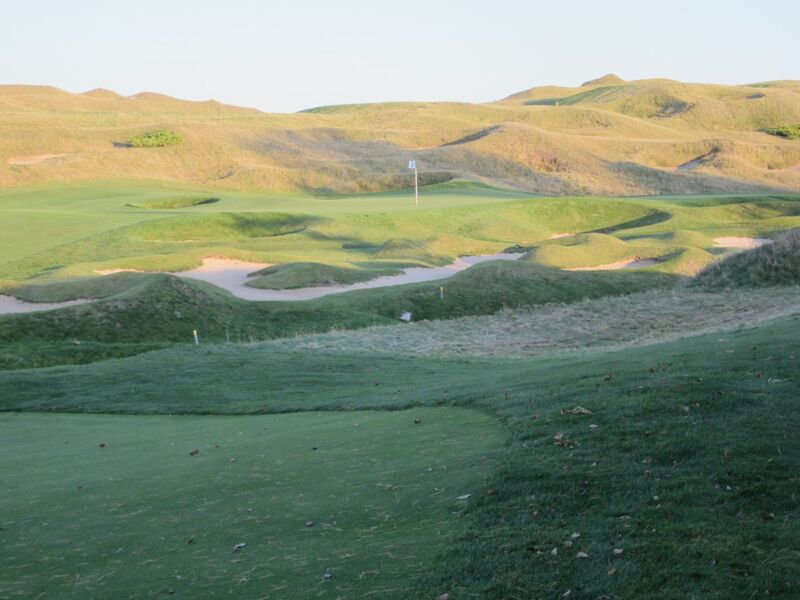 This is a beautiful hole, especially around the green where the bluffs and randomly placed sand traps blend harmoniously with the terrain, but make for treacherous short game. This carries over to all holes on the Irish. 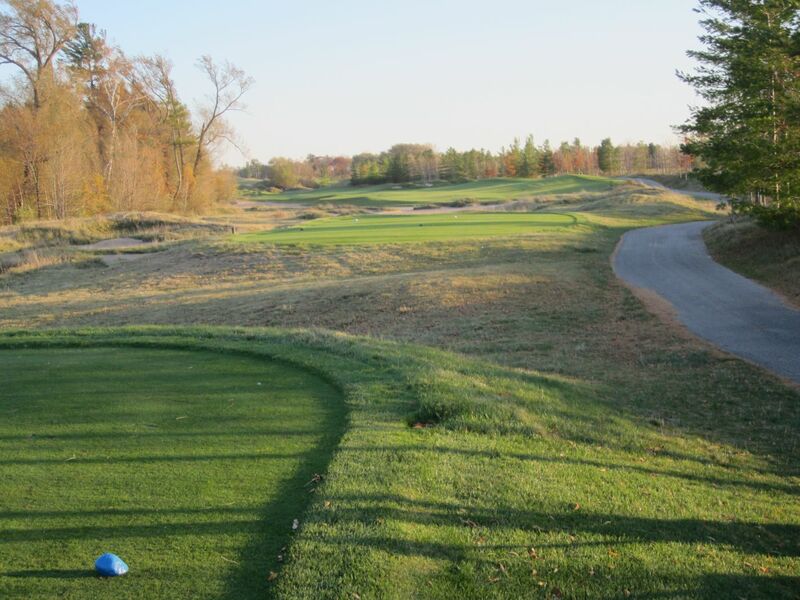 The second features an intimidating tee shot, with a huge pond that runs along the left side of the fairway. 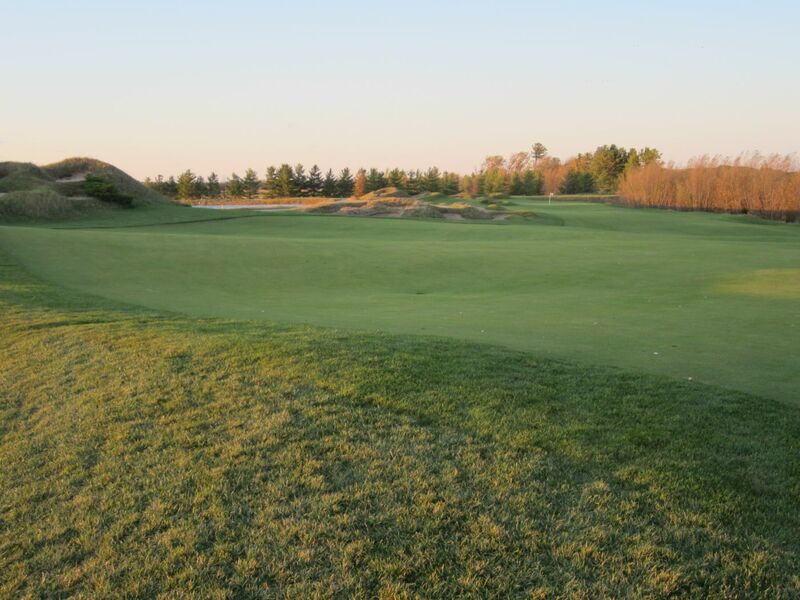 The green is surrounded by sand, and is very tough with regards to the slopes and overall run. 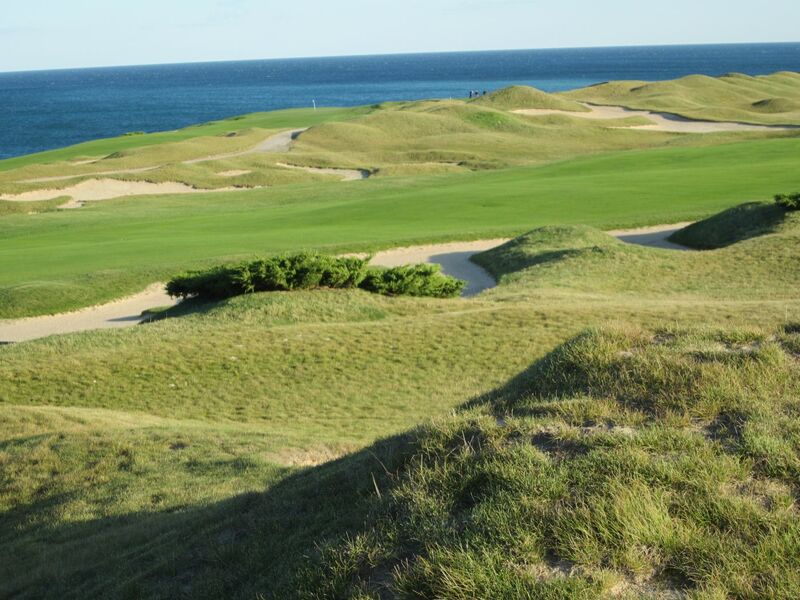 Whistling Straits’ greens are unbelievably fast, and I can only compare them to the Links at Lawsonia in difficulty. As one of my friends explained, though, the greens are more fair: They are easier to read and roll true, but are lightning quick and break abundantly. 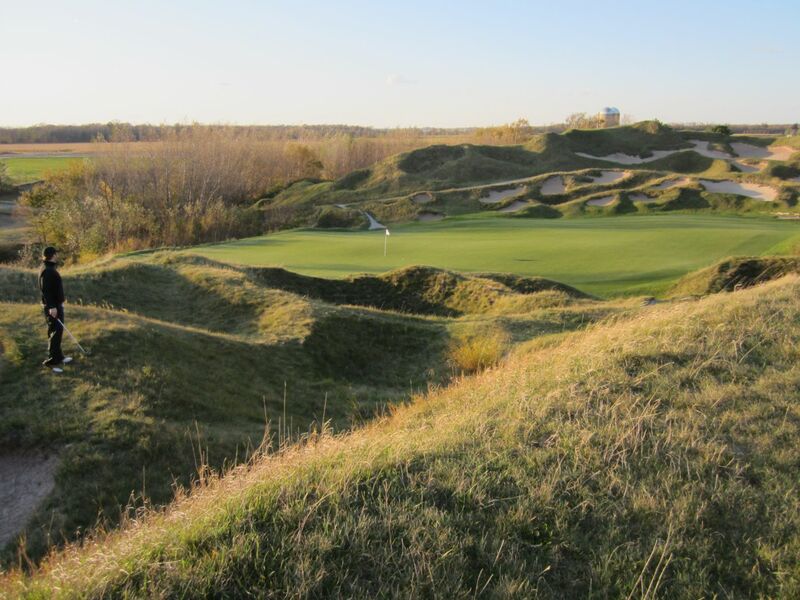 The third hole is a tough par three. 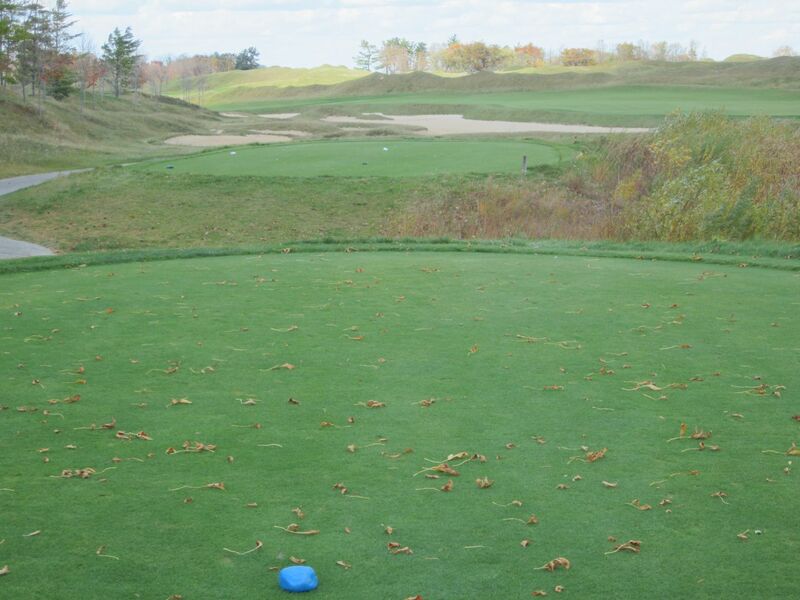 At under 140 yards from the blue tees, I was the only one to hit the green… With a 6-iron. The wind howled so strong that I clubbed up four times, aimed over the middle of the pond, swung, prayed, and found myself on the front side of the green, thankfully not landing beneath the railroad ties that buttress the green from the wide front-side bunker. 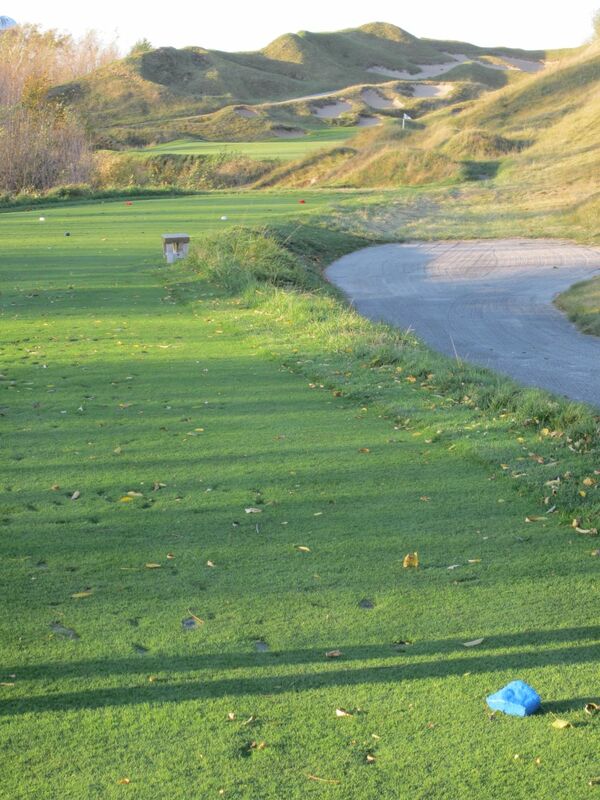 The fourth promotes a true risk/reward tee shot. How much of the sand area are you willing to risk trying to cut? It runs more than 250 yards straight in front of the tee boxes before the fairway rolls left and uphill to a green that has a massive bunker along the right side. 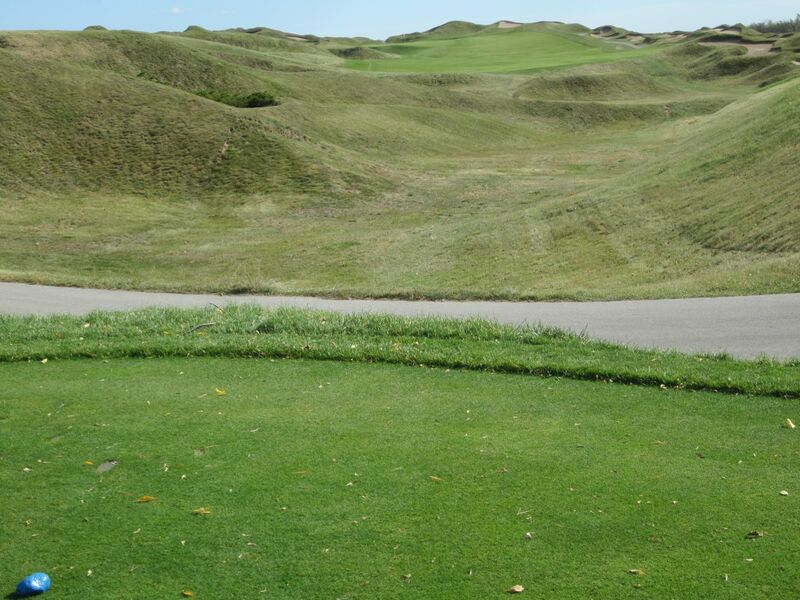 A back-right hole location made the approach and putting conditions laughable. After reaching the green in three strokes, for example, I took a seven after four-putting. I was not alone. The fifth is a beautiful par five. 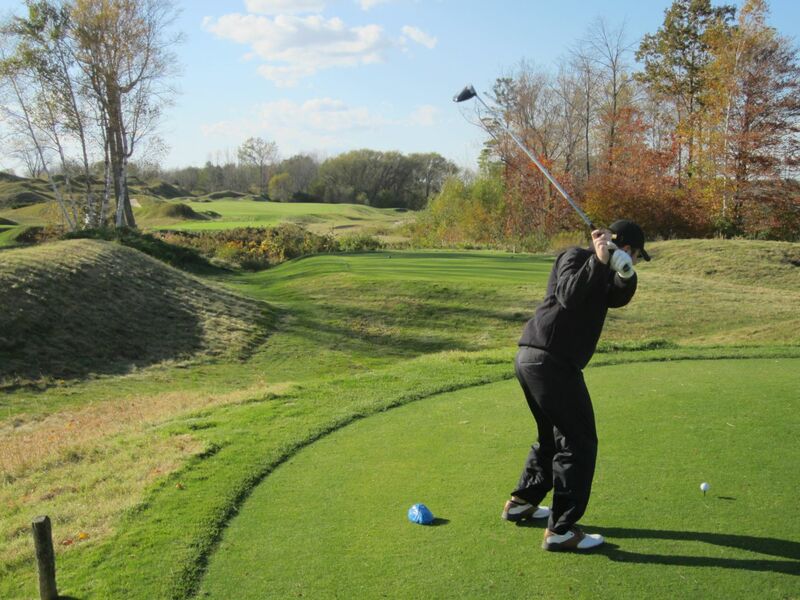 Keeping your tee shot in the fairway will give you a chance for a green in regulation, but heed the waste area on the second shot as it will attract anything errant. From before the waste area, the approach will be long and carry more sand. What were the odds? If the Straits course has 967 sand traps, the Irish cannot be far behind. 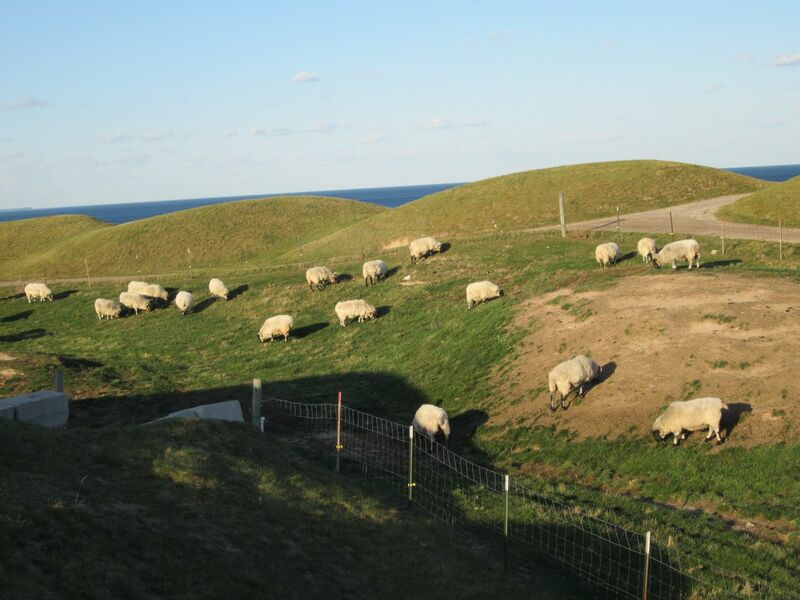 If there is one relief to the bunkers at Whistling Straits, it is probably that most are unnecessary to rake. 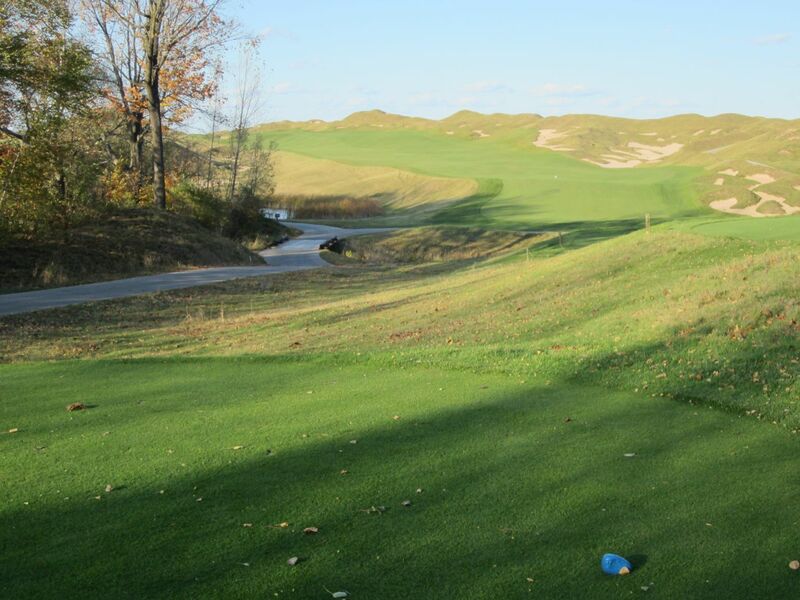 Whether Kohler was unable to afford that many rakes, or the traps are meant to be played as hazard areas, it does help speed up play significantly. The Irish plays as efficiently as you are able to. During the times I have been there, it feels as though we are the only ones on the course. The holes are well-spaced, and the only factor holding back play is you and your companions… And me, snapping pictures of the course. 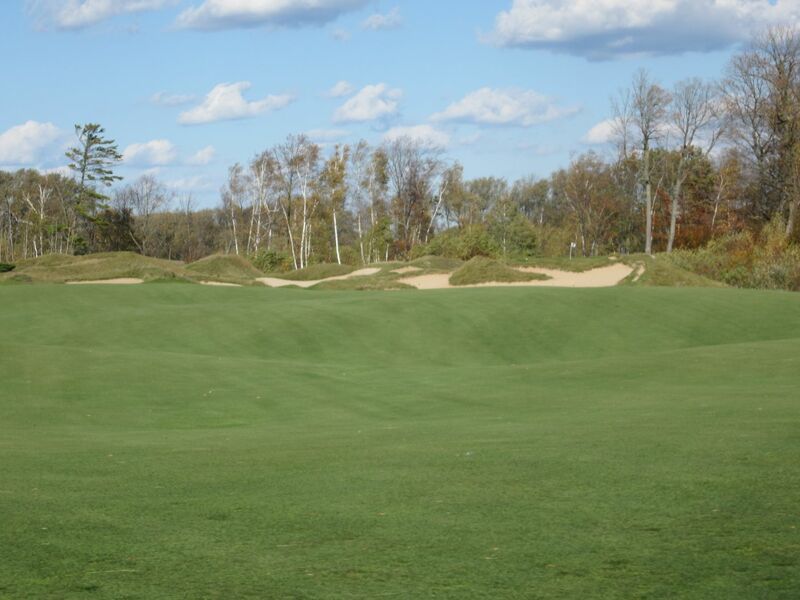 At 363 yards from the blue tees, the seventh is one of the shortest par fours on the course. 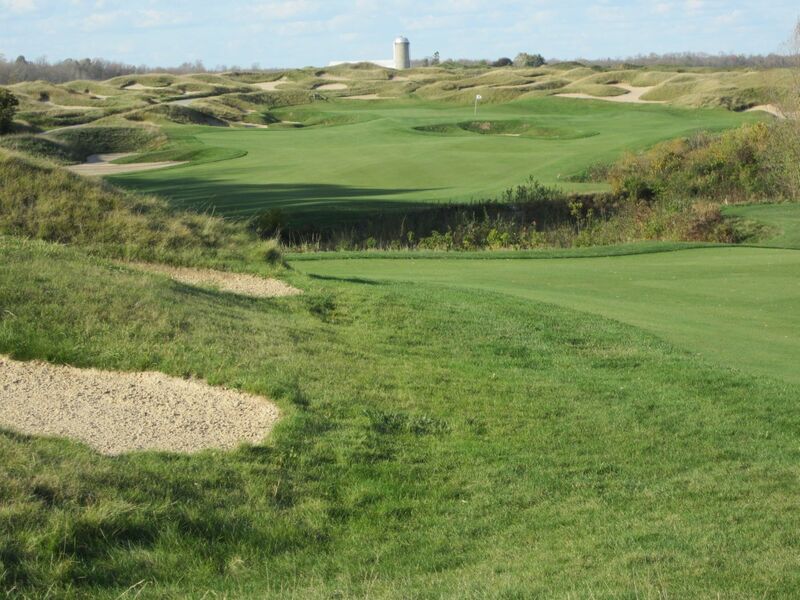 The fairway flows to the right following the sand traps that run along that side, but trying to fly these traps will most likely lead to the out of bounds area just beyond. This is a great hole to play smart. 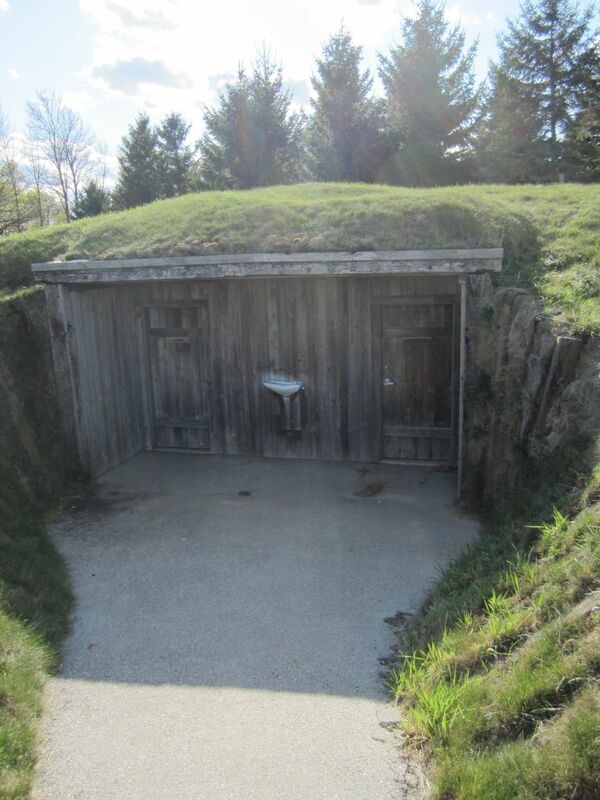 The eighth is one of my all-time favorite par fives. After parking the cart and walking back to the tee boxes, there is a carry to the tee shot of a little over 100 yards to the fairway. The right side drops about 15 feet off the playing surface, so if you land there then take your medicine and re-find the fairway. The setup shot is played over an inland stream and uphill to one of the most beautiful green areas I have ever seen. Littered with sand and an almost impossibly sloped green, a par here would feel like a birdie on almost any other hole. The front nine ends with a short, but difficult, par four. 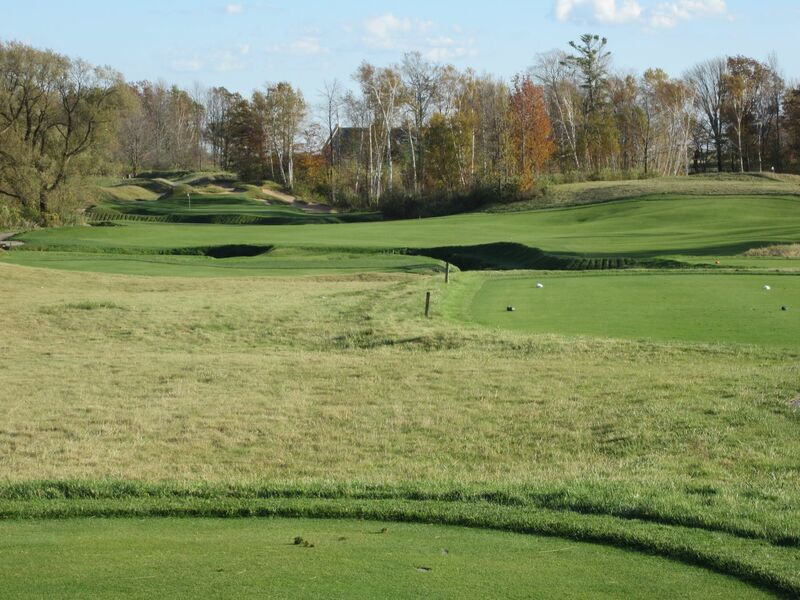 “Last Gaspe” features a wide fairway, but the right side can lock out a clean shot at the green. 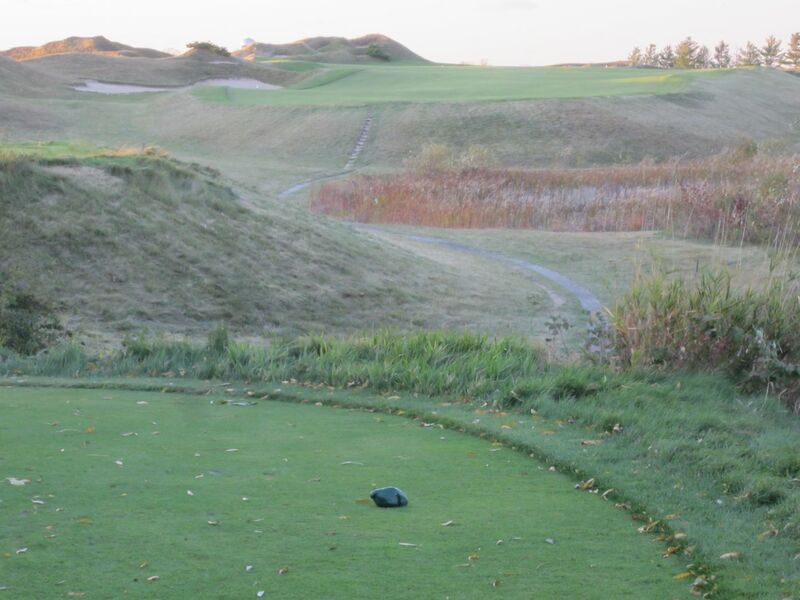 With a high cliff on the left side of the approach, the eleventh hole is a phenomenal par three. The wind here was so strong that the 160 yards was played with 3-woods over the cliff on the left side. It is unfortunate the ball is not more visible in the video below, because the flight path was incredible to watch. The wind on the twelfth was blowing steadily in excess of 50 miles per hour, and straight toward the lake. Good luck! 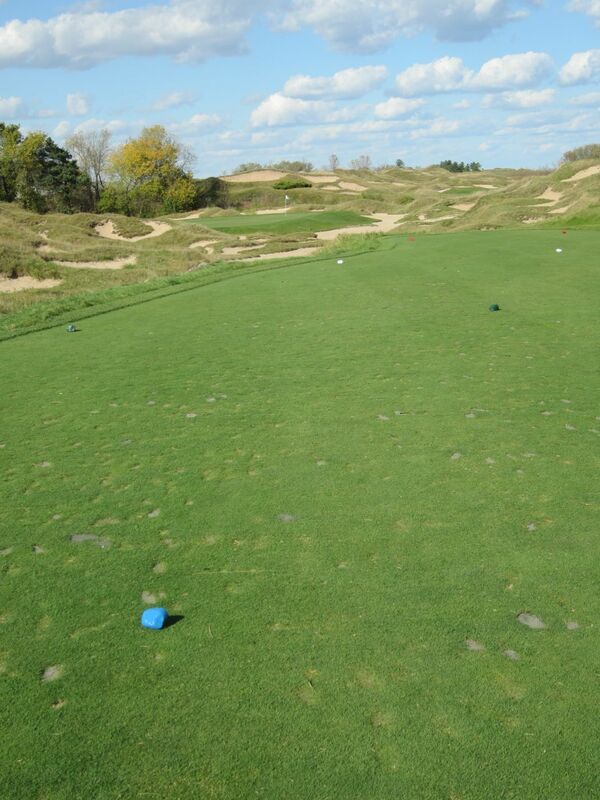 Fortunately for our group on Sunday, the back tees were moved downhill on the thirteenth hole. From up top, the wind would have left an impossible [and blind] tee shot, but from below the wind was at least slightly blocked out by the trees bordering the tee boxes. 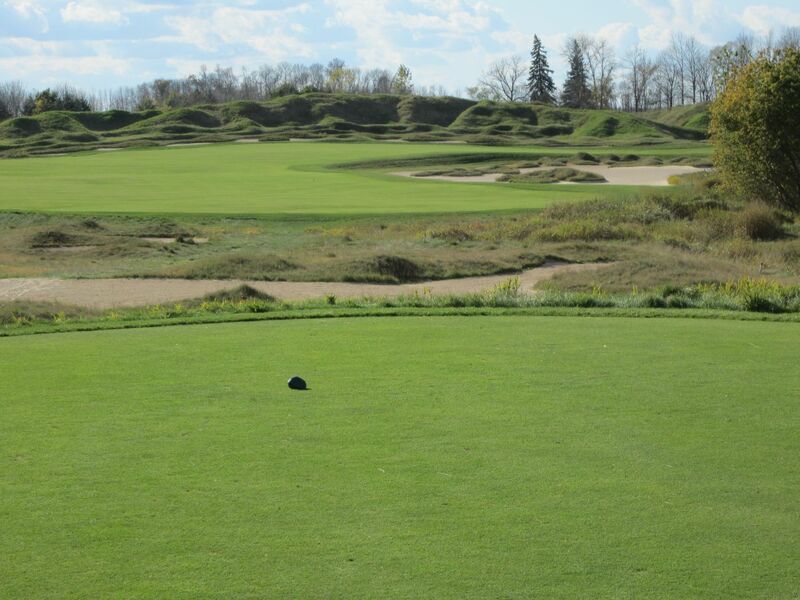 At 160-plus yards, it remained anything but easy, and this hole is nothing short of spectacular. 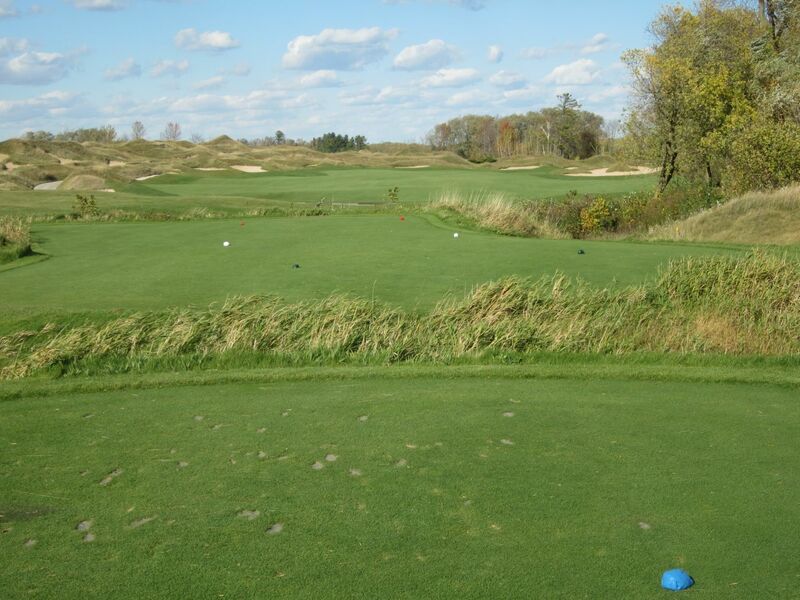 A “fun” par five, the fourteenth has a wider driving area than most on the Irish course. 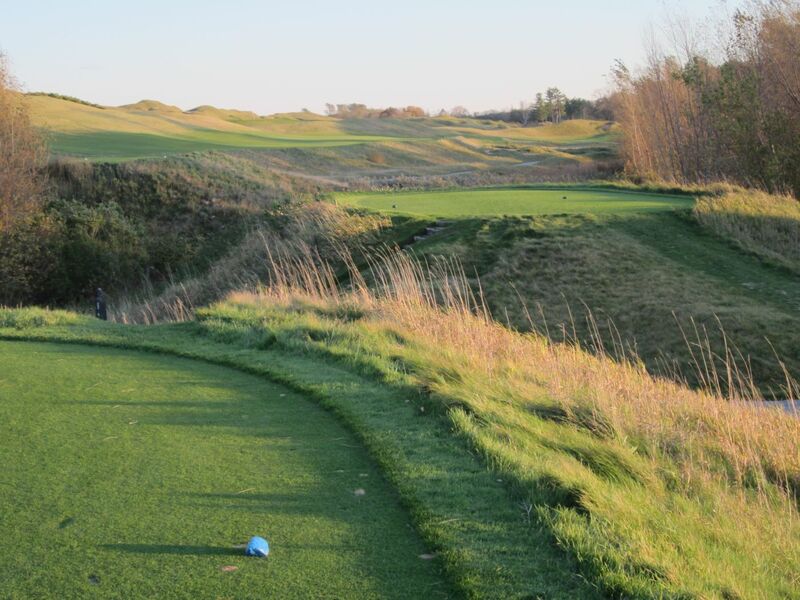 A stream fronts the approach, so getting to the opposite side in two provides a significant advantage on this hole. Fifteen is the number one handicapped hole on the Irish. 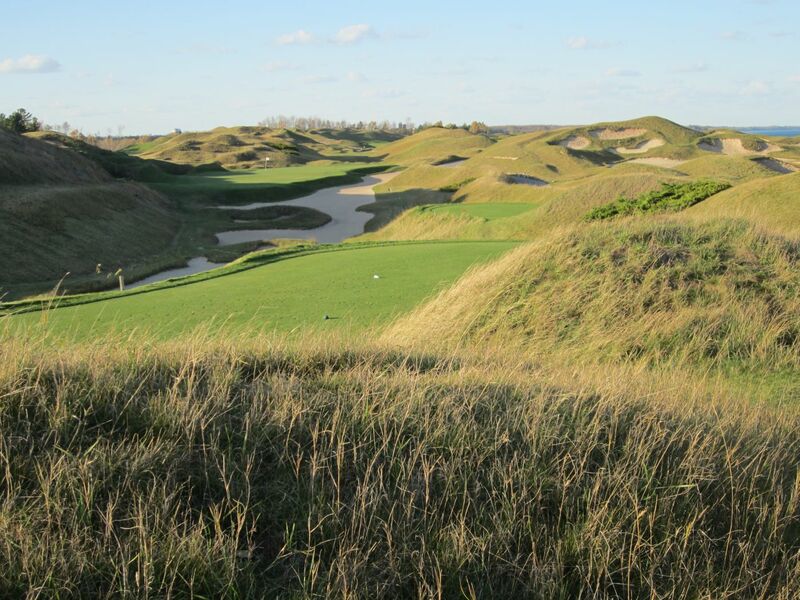 At 459 yards from the blue tees, it is easy to see why. The tee shot is simple enough, but the approach will always be long and to an area that is surrounded by deep greenside bunkers. The tee shot on the sixteenth reminded me of the same swing on the previous hole. Another lengthy par four (436 from the blues), the tee shot is mostly blind and falls significantly to the right. Try to stay left if you can, but take heed of the monstrous pond that lines the final three holes of the Irish course. The green area contains a number of individual plateaus that make for a challenging approach. The seventeenth is scenic and narrow. With the same lake running the distance of the hole, the mounds along the right side of the fairway and cart path will actually provide assistance if your drive cuts. 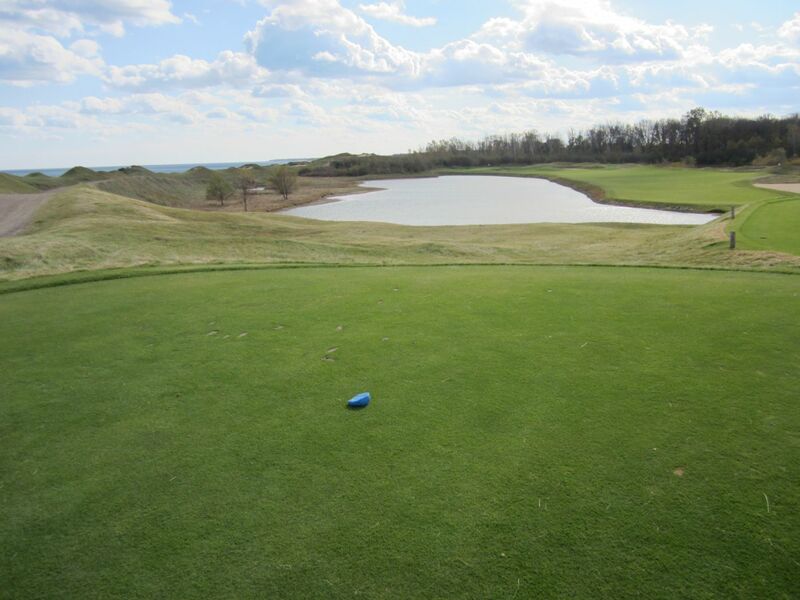 Outside the fairway, though, there is little opportunity to fly the lake and find the green in two. The Irish finishes with a fantastic par five. 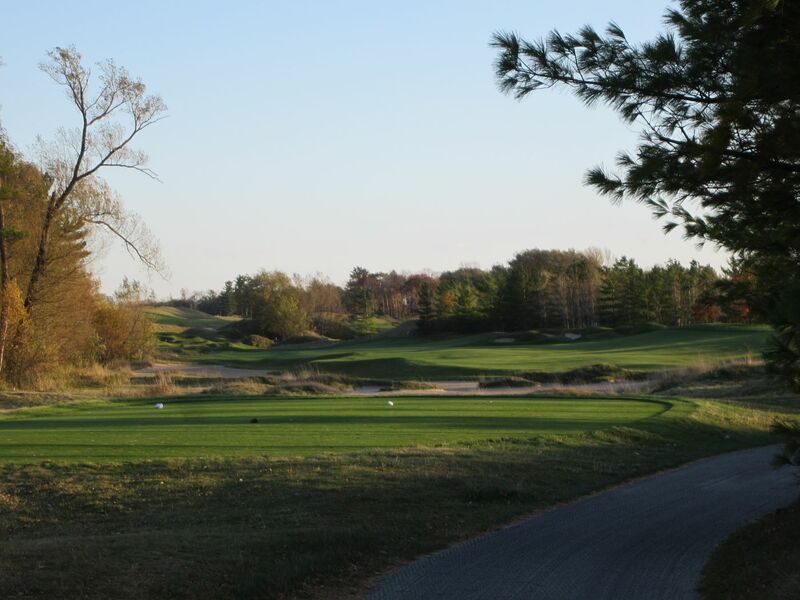 With a tee shot over the inland lake, the fairway falls right and downhill following the sand traps on the right side. Half-way through this downhill section of the fairway is a stream that will take anything hit short. The fairway then rises upward to the green. 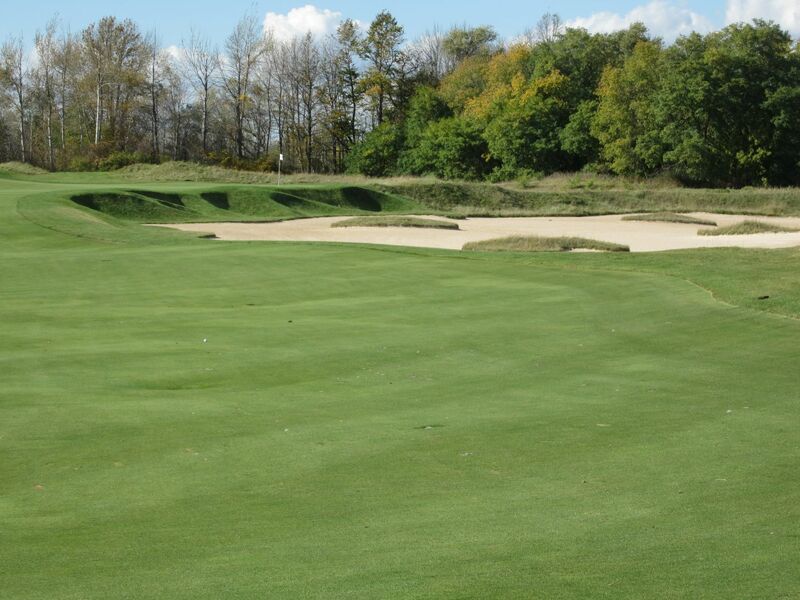 A deep bunker lies along the left side of the green, so if you’re going to miss, at least miss right. The golf courses in Ireland are of outstanding quality, yet many of those courses are attached to luxurious castles, resorts and hotels.